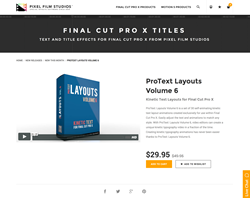 "ProText Layouts Volume 6 allows video editors to create a unique kinetic typography video with absolute ease and complete customization," said Christina Austin - CEO of Pixel Film Studios. 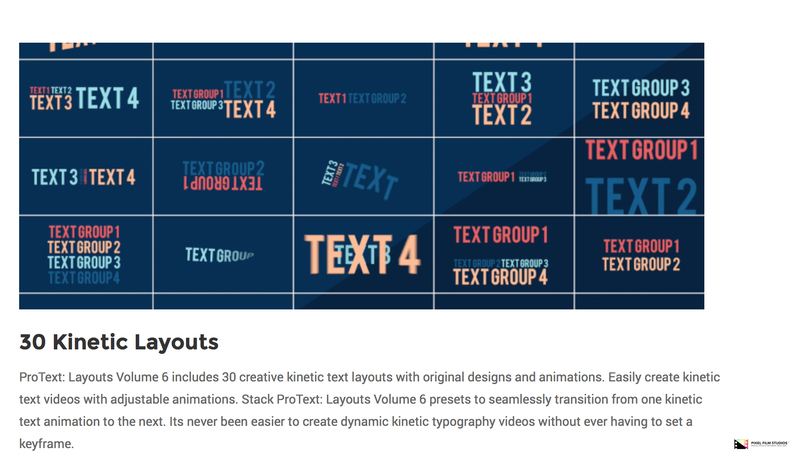 ProText Layouts Volume 6 includes 30 creative kinetic text layouts with original designs and animations. Easily create kinetic text videos with adjustable animations. Stack ProText Layouts Volume 6 presets to seamlessly transition from one kinetic text animation to the next. With this plugin users can easily create dynamic kinetic typography videos without ever having to set a keyframe. ProText Layouts Volume 6 can be placed over pictures, videos, and generators within Final Cut Pro X. 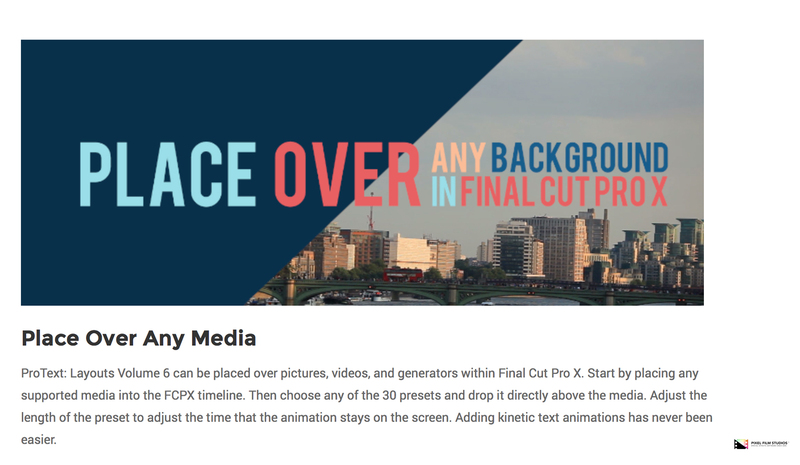 Start by placing any supported media into the FCPX timeline. Then choose any of the 30 presets and drop it directly above the media. Adjust the length of the preset to adjust the time that the animation stays on the screen. Adding kinetic text animations has never been easier. ProText Layouts Volume 6’s text can be easily manipulated. 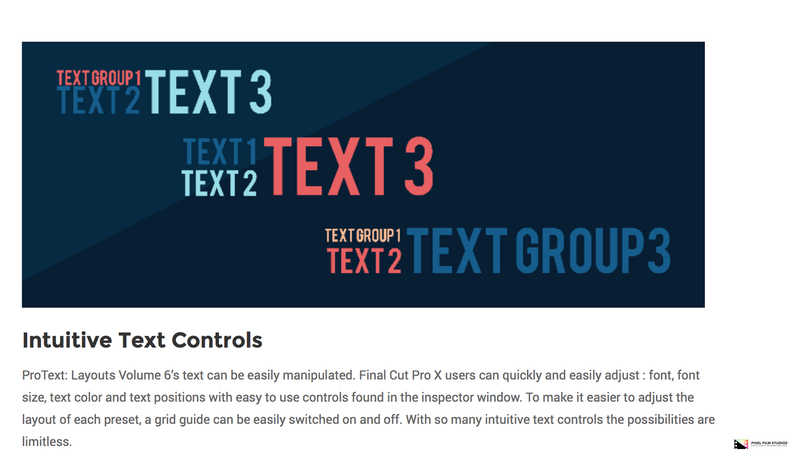 Final Cut Pro X users can quickly and easily adjust : font, font size, text color and text positions with easy to use controls found in the inspector window. To make it easier to adjust the layout of each preset, a grid guide can be easily switched on and off. With so many intuitive text controls the possibilities are limitless. ProText Layouts Volume 6’s presets are packed with professionally designed Intros and Outros. Animations range from clean and simple scale ins and mask ins to more creative bounce and rotation animations. Choose from custom made presets with flipping, scaling, masking, bouncing, sweeping, and rotating animations. Each preset includes a motion blurred and a non motion blurred option to fit any need. 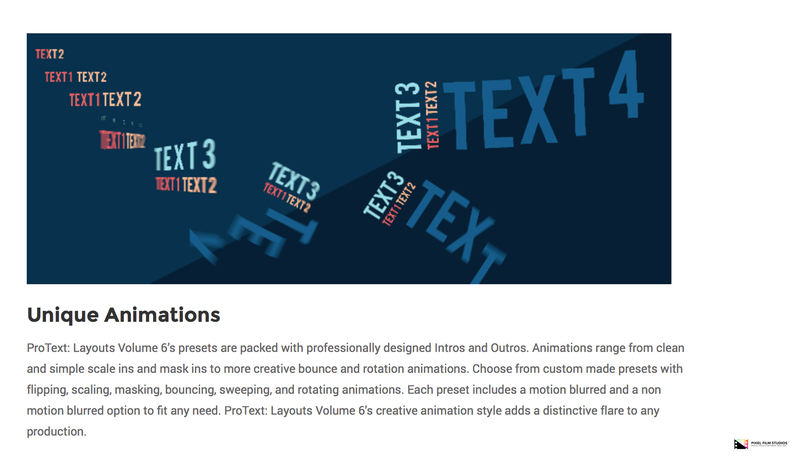 ProText Layouts Volume 6’s creative animation style adds a distinctive flare to any production.